Jiujiu Peak is very unique and recognizable because it is composed of a number of razor-like peaks that came to shape after the 921 Earthquake in 1999 and seismic activities in the area. Legends say there are 99 peaks in all, which is why it is called “jiou-jiou” or “99″. It is easy to spot Jiujiu since it is visible from the Shuandong Section of Provincial Highway 14A. Jiujiu is actually a volcano and one of the three major volcanoes in the country along with Huoyen Mountain in Sanyi and Huoyen Mountain in Liugui. Most tourists visiting Nantou come to hike on several popular Taiwanese mountains, and Jiujiu Peak is one of the most sought-after sites. Attractions within the Jiujiu Peak Nature Reserve are exotic plants and animals (such as the Formosan rock monkey and leopards), as well as green pines, steep slopes, and deep valleys, which make it truly a one-of-a-kind landscape. Jiujiu has gone through hundreds of earthquakes, erosions, weathering, and ground deposition, which worked together to create the peak’s special geological landscape. 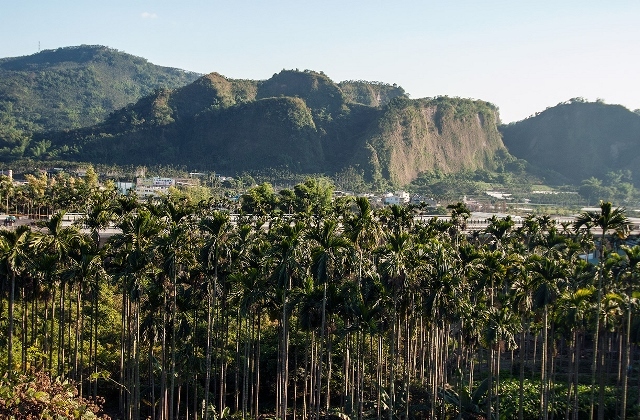 The 921 Earthquake and other tremors that have shaken the mountain through the years are said to have collapsed a total of 878 hectares of land. Until today, Jiujiu Peak Nature Reserve is listed as a disaster nature reserve. Nantou is the center-most county in Taiwan. Since it is located in the central interior of this island-nation, Nantou is the only county without a coastline. However, its beautiful landscape and greeneries make up for its lack of beaches and dive sites. Nantou County also lacks its own rail system. Taiwan’s high-tech, high-speed train reaches up to Taichung only, and so visitors to Nantou get off at the Taichung Station. To get to Jiujiu Peak, travelers take a local Nantou bus from the Taichung train station to Puli Township, and get off at Caotun Stop. When driving, travelers may take Freeway 1 to Freeway 3, then to Freeway 6, and exit at the Dongcaotun Interchange to get to Tou-6 Township Road, then to Tou-10 Township Road, and finally on Provincial Highway 14 that leads to Caotun. Jiujiu Peak Nature Reserve is a wide area, covering Tsaotun Town, Kuohsin Village, and all the way to Wufeng in Taichung.